My life was in a transition point when I first started blogging and now I find myself myself in a similar - yet strongly different - situation. I am changing and evolving and growing as a person and my life is starting to align with that. My anxiety is heightened by clutter (both physical and mental) and stress. I'm a mom of two, I'm homeschool my five year old, I babysit for a family that we love, I'm journeying down the path of minimalism, all while working towards my goal of publishing my first book. Although I love spreading the word about great books and helping out authors, I no longer enjoy the act of blogging. It's become more of a burden instead of a pleasure and there are other, more precious and important things where my time could be better spent. I'm ready to tackle my own goals and dreams and put my energy into my family, my life, and my own writing career. 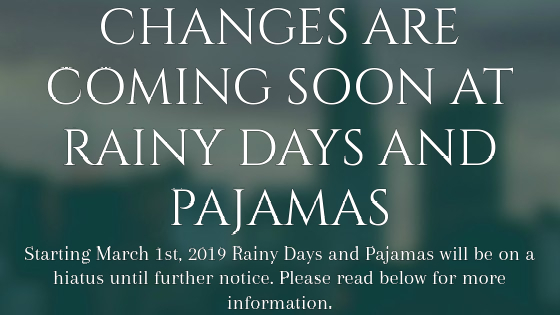 I will still be sharing on the Rainy Days and Pajamas Facebook page and sharing my thoughts on books that I read but I will no longer make reading such a job. Reviews that I have promised will still be posted, ARCs will still be read, but this blog, until further notice, will officially be on hiatus. When it will become active again, I'm honestly not sure. It honestly may never be active again. I have events scheduled from December and throughout February but that will be it guys. Good luck, Darcus, with your writing! I wish you all the best, and cannot wait to see your dreams accomplished!